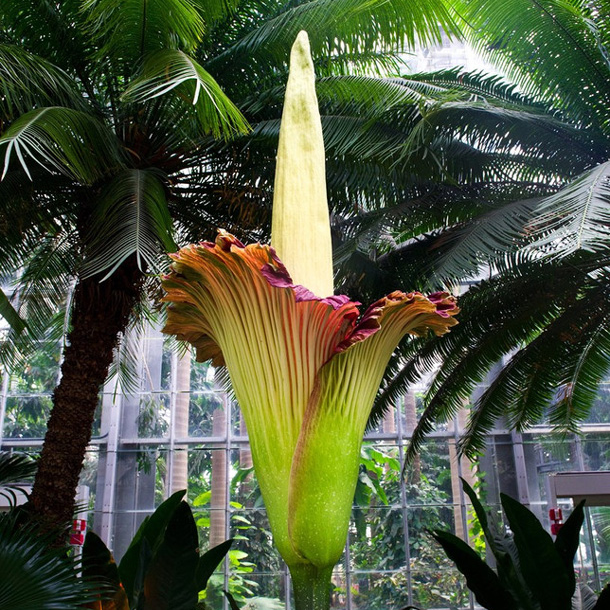 A rare flower, called the titan arum, is about to blossom at the U.S. Botanic Garden. Unlike most flowers though, it is very smelly. Some people say the smell is like rotting flesh or a dead body. That is why the flower is sometimes called a corpse flower. Corpse is a term for a dead body. The flower comes from Indonesia where the tropical climate is warm most of the time. Washington, D.C., is warm in the summer, but it is too cold for the plant to survive outside during the winter. So the plant lives indoors in a greenhouse, where the temperature can be controlled and it is warm and humid year-round. The plant does not produce flowers each year. Once it blossoms, it may not bloom again for a number of years. The flower is actually a collection of a hundreds of small flowers working together. The titan arum produces its strong smell to attract insects. The insects help pollinate the flower and make sure the titan arum can produce the next generation. The bad smell only lasts about two days. After that, the plant goes dormant again. The U.S. Botanic Garden has shown five other titan arums since 2003. This is the first time the six-year-old plant has blossomed, and people are excited. The garden is open to visitors longer than usual each day so people can see the flower. It is supposed to be smelliest at night. There is also a live webcam so people can check the status of the plant. Last week, the same kind of plant bloomed at a garden in New York City. Many people posted videos and photos on Facebook and Twitter. The one in New York opened on Friday. By Monday, it was not smelly anymore. This open-air space is also part of the Botanic Garden. We all languished in the tropical climate. We must fulfil our duty to the country, and to the next generation. Oranges abound here all the year round. 1.The flower is actually a collection of a hundreds of small flowers working together. Working together we can make globalisation work for the whole world. 2.Some people say the smell is like rotting flesh or a dead body. They' ll demolish this house over my dead body. The heat accelerated the corruption of the dead body.